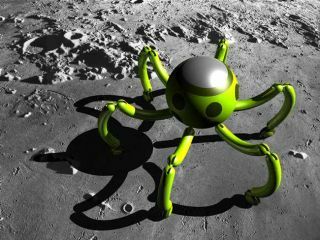 A concept illustration of Team Italia's spider-bot on the moon. Whatbegan as a glimmer in the mind's eye for one robotics researcher has grown intoa national endeavor for Team Italia, one of 17 groups competing for the GoogleLunar X Prize. "TeamItalia has evolved," said Piero Messina, president of the Naples-basedInternational Association for the Aerospace Culture (AICA) that is coordinatingTeam Italia. Messina helped pull together all the major Italian aerospace andengineering universities, as well as the two largest Italian aerospacecompanies, to support the race to landa robot on the moon by 2012. Theidea to compete for the Google Lunar X Prize crystallized around the vision of AlbertoRovetta, a professor of robot mechanics at Politecnico di Milano. Rovetta'sdesigns for lunar robots resemble skitteringspiders or crabs that could deploy as a swarm of mobile cameras and sensorson both legs and wheels. Suchunorthodox designs may help the team seize the GoogleLunar X Prize, which requires teams to land a robot on the moon, move atleast 1,640 feet (500 meters) and beam high definition views back to Earth. However,Messina noted that safe, time-tested technology remains crucial to TeamItalia's goal of meeting the Google Lunar X Prize objectives. The group alsowants to remain within a target "financial envelope" of $20-30million, given that the X Prize awards $20 million for first place. "Newtechnology would add to the cost, but it all depends what will be available tous," Messina told SPACE.com. "Of course, we would love to testnew technologies and new robotic things." TeamItalia will also likely focus on lower-cost alternatives to commercial launchvehicles, such as the European Space Agency's Vega rocket that is alreadyslated to launch an experimentalreentry spacecraft in 2012. Theteam is currently occupied itself with organizing the principal players andlooking at preliminary mission design, never mind sizing up the competition forthe Google X Prize. "At the moment we are competingagainst ourselves," Messina noted. Manyof the competitors have made no secret about the challenges of attractingfunding, but Team Italia hopes that its national theme can carry the day andattract sponsors even outside the aerospace industry. Messina compared theirprivate endeavor to those of sailing teams that attract national sponsors forthe America's Cup, and stated the goal of bringing "a new philosophy offunding space missions" to Europe and Italy. "Whatwe are trying to leverage is that most of aerospace community in Italy isbehind this project," Messina said. "We really want to give anItalian flavor to the undertaking." Despitethe emphasis on a private Italian undertaking, the team may ultimately partnerwith the European Space Agency (ESA) and broader international groups. Messinaemphasized Italy's active role within ESA and cooperative activities with NASA. "Oneof reasons behind this is that Italy is playing a driving role in Europe inexploration matters," Messina added. "This is meant to strengthen therole and reputation of Italian aerospace community as far as exploration isconcerned." Video - Flowers on the Moon?